Fuzzlers are caterpillar-like enemies that appear in Super Mario 3D World, and are predominantly seen in Switchboard Falls. Their name is a portmanteau of Fuzzy and Wiggler, which they resemble a cross between. 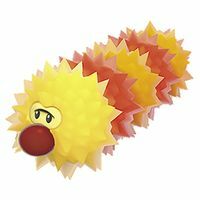 Fuzzlers are made up of yellow, orange and golden spiky balls that hurt the player upon contact. Fuzzlers always appear on Switchboard tracks, and roll along the tracks in a set path. Two or more Fuzzlers usually appear in a track network, each one going a separate direction. When Fuzzlers collide, they will start moving in the other direction. They can only be defeated with the invincible forms. Imozō From imomushi (芋虫), meaning "caterpillar"
↑ Musa, Alexander, and Geson Hatchett. 2013. Super Mario 3D World Prima Official Game Guide, page 27. This page was last edited on April 22, 2019, at 12:27.